May Means Hope for Mental Health! People often ask me what my dream is in my work at The Flawless Foundation and my answer is always the same: a world where the cause of mental health is celebrated and where every person living with these challenges is embraced by society. And what is also always the same is the vibrant hope that punctuates the Didi Hirsch "Erasing the Stigma" event every year. 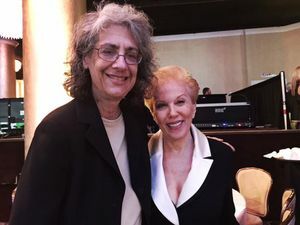 This dinner benefits the incredible work of Didi Hirsch Mental Health Services in L.A. and is by far one of the truest expressions of the power of community, authenticity and changing the paradigm around this public health emergency that affects us all. 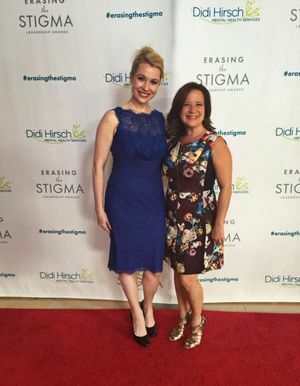 "Erasing the Stigma" is filled to the brim with fun and hope shared through powerful stories from people who have personal experiences tied to this cause. This level of authenticity normalizes and celebrates the mental health conversation. One of my favorite moments each year is when Didi Hirsch's CEO, Dr. Kita Curry, asks everyone in the room who has, or knows someone who has mental health challenges to stand; not surprisingly, almost the entire room stands up! Last year's theme was amplifying the volume about this issue through the power of social media. For the third year in a row, mental health advocate Ross Szabo and I had fun taking our annual selfie together. 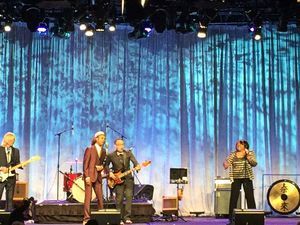 This year, the evening launched with singer/songwriter and Mental Health Ambassador Mary Lambert performing her deeply personal hit song, "Secrets." 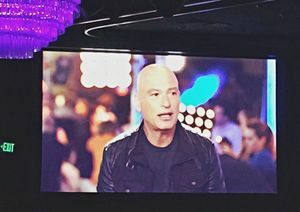 Comedian Wendy Liebman was the emcee, balancing the mood between lighthearted and serious, and she spoke eloquently about the awe-inspiring Howie Mandel, who accepted his award via video. Howie's speech was riveting as he talked about living with Obsessive-Compulsive Disorder and how lonely it can be to live with these challenges. He talked about how toxic isolation is, and how we must stay connected because these issues are very common, affecting 1 in 4 people. The discussion moved on to the difficult topic of suicide, with the iconic Jeanne Phillips ('Dear Abby') speaking about the thousands of messages she receives every year from people who are affected by suicide - and she also commented on how most of the people reaching out to her are women. She urged us to focus on men and mental health, and how to find ways to make this topic more accessible to men. Jeanne Phillips, right, with Elyn Saks, Founder Saks Institute, USC Gould School of Law and MacArthur Grant recipient. One man who is truly a mental health hero is Pelican's forward Ryan Anderson, who received the Leadership Award for his advocacy around suicide prevention - a mission he embarked on after losing his girlfriend, Gia Allemand, to suicide in 2013. And tears were flowing as Senator Darrell Steinberg spoke poignantly about needing to pay attention to every person who is facing a mental health challenge, to bring these issues "out of the closet," to embrace the idea that people can be healed - an issue close to his heart after going through years of ups and downs with his daughter Jordana, who lives with a mood disorder. Jordana also spoke about her personal experiences and inspiring recovery. The night ended with a fabulous performance by one of Didi Hirsch's Board Members Shawn Amos, who has been a long time mental health supporter speaking openly about his mother's death from suicide and commitment to this cause. As we launch into Mental Health Awareness Month, let's use the inspiration of the community at Didi Hirsch to help us all find ways to unify around these issues. To take the risk in connecting with others through our authentic stories, to find ways to step out of fear and judgement, to "see the perfection in every person," which, of course, begins in the most difficult place: within ourselves.